To round out a great co-op year, Game Informer took polls asking community members how they feel about specific co-op aspects in games, and asked a few key co-op developers how the co-op process works for them. Out of these community polls, statistics arose that made Co-Optimus.com very proud of the gaming community at large. For instance, 51.9% of all gamers surveyed responded that they'd rather play social games than single player. Of those social gamers, 64.5% of them prefer friendly co-op to competitive multiplayer. Developers have heard this preference and share the desire to game with their friends. As such, many studios have to decide what kind of experience they want out of their game very early on. One of the developers interviewed has a variety of co-op and single player experiences in their games. Erik Johnson, the project manager of Valve discusses how the experience differed between the single-player-hit Half-life and the co-op beauty Left 4 Dead and the quick-release sequel Left 4 Dead 2. It's important for developers to decide what they want to do with their games early on, because co-op is a lot of work to implement and may not happen later. Not just online co-op, but also split-screen, or combined split-screen and online co-op. These decisions have to be carefully weighed, or the game may lose some other important aspects in favor of others. Another poll indicated that 49.9% of co-op players prefer online co-op, but split screen isn't far behind with 32.4%. As a co-op exclusive community, we tend to wonder why split-screen is dropped in so many cases? Why the integration of split-screen and online is so rare? Technically speaking, the console has to work twice as hard to run a co-op game split screen. But I'll let Cliff Bleszinski, design director of Epic Games explain in more detail. After going through the trouble of adding split-screen, how much harder is it to add online connectivity? This feature for co-op is in high demand for our gamers who wish to play with spouses as well as the wonderful people they meet through our gaming meet-ups and co-op nights. We just need to know, and Randy Pitchford, president and CEO of Gearbox Software gives us the details. Gaming together is all well and good, but when you have split-screen and your little brother/sister wants to play a game with you, do you really want to carry him/her through an entire campaign if they can't cut it? Or, crank down the difficulty, so the game is actually boring to play, while the other player is still challenged? One thing we'd also love to see more of, is the individual difficulty settings for players of different skill levels. Reid Schneider, the executive producer of Army of Two: The 40th Day explains that this one isn't that difficult if you work around it, as well as some obvious benefits to separate difficulties. In order to offset the costs for the work involved with adding co-op, Game Informer suggested the possibility of a pay-to-play fee for each game. Gamers surveyed immediately responded with an overwhelming 69.2% that they would not pay for specific co-op features. Each of the developers asked about the possibility of pay-to-play co-op also shot it down immediately. We think Erik Johnson, the project manager of Valve says it best. Now that all the technical stuff has been covered, we wanted to share a few more of the poll results in the name of co-op. We've seen what gamers like according to Game Informers polls, but now for the little nags about co-op games -- which we have seen as a community as well. The top contender is limited co-op modes, such as we have seen with Overlord 2, or Super Mario Galaxy. There was also a preference toward games that have an alternate co-op partner, like Dom in Gears of War or G-Unit members for 50 Cent: Blood on the Sand. Something developers may want to pay attention to: 51.2% of gamers say they're more likely to buy a game if it included co-op. Now that we've seen what Game Informer readers have to say, it's your turn. 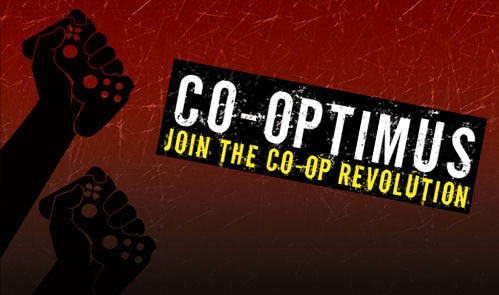 We know you like co-op (why else would you be here?) now tell us what you want to see more of, less of, or improvements on in the comments. No really, the developers are listening - chime in to have your voice heard. Page created in 0.6568 seconds.